This 24 inch linen tower features a minimalist design that pops with colour thanks to the refined Twilight Gray finish with matte gold trim and hardware. It features a solid wood birch frame, interior shelves, a toe kick for convenience, soft-close hinges, and offers plenty of storage space. It is a perfect companion to the Allie / Austen vanites. This wider, upscale, cutting-edge, fully modular linen tower is a special merged edition of its slimmer counterpart. Featuring 6 soft-close dove-tail jointed drawers, and a modern, dual-door cabinet with a clear fronts, which sits atop. It measures 24 in. across, 17 in. from back to front, and 82 in. from top to bottom. Comes in a deep, sensuous coffee finish. The Layla 20 inch linen tower presents a sleek and attention-grabbing profile that will make your bathroom "The Room" in your home. A pristine white finish and dazzling blue glass hardware please the eye while the solid wood frame, dovetail joint construction, and soft-close glides and hinges testify to quality craftsmanship. Layla's uncluttered panels allow the beauty of its design and construction to shine through. The linen tower completes your bathroom design with the Layla vanities. Let Layla bring your bathroom to life. Elegant and Functional. Those are the criteria that guided us in creating the Riley 24 inch linen tower with hamper. With its clean transitional lines, pristine white finish and refined brushed nickel hardware, Riley embodies a contemporary aesthetic that dazzles in multiple design settings. Generous storage features include soft-close doors and drawer, and a tilt out hamper. Timeless yet trendy, the Classic Collection of bathroom vanities, storage cabinets and mirrors from Cutler Kitchen and Bath is a perfect compliment to any bathroom. These linen cabinets are a perfect solution to all your storage needs, available in 5 matching vanity colours door styles, supplied with brushed chrome handles, European soft closing hardware and adjustable shelves. 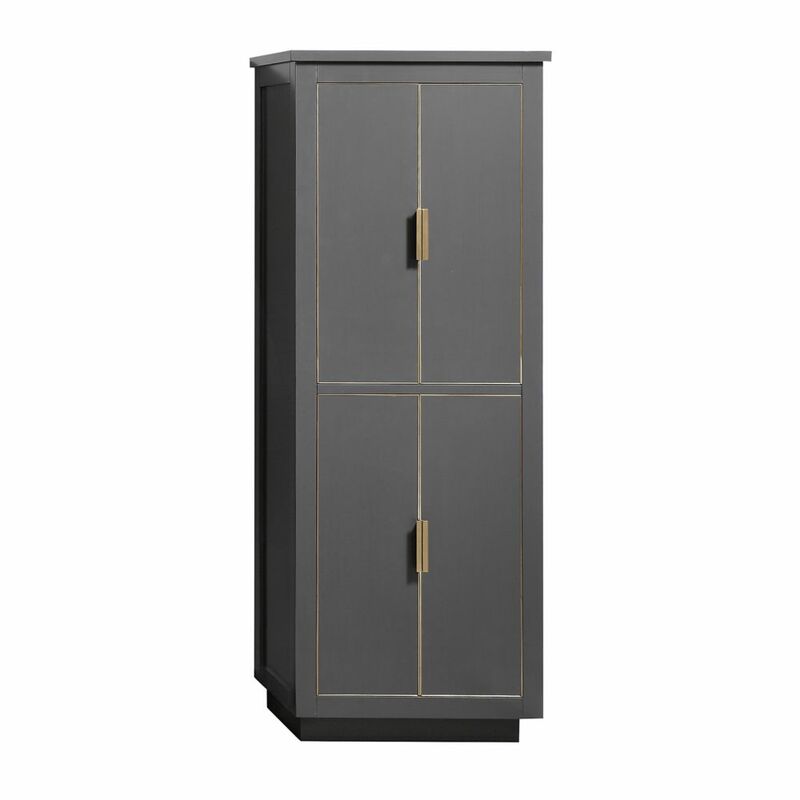 24 inch Linen Tower for Allie / Austen in Twilight Gray w/ GoldTrim This 24 inch linen tower features a minimalist design that pops with colour thanks to the refined Twilight Gray finish with matte gold trim and hardware. It features a solid wood birch frame, interior shelves, a toe kick for convenience, soft-close hinges, and offers plenty of storage space. It is a perfect companion to the Allie / Austen vanites.